Frances had a hard life. Most of us experience moments of hardship in our lives. Some of us have lives that are mostly hardship. 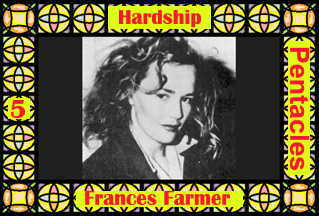 Frances Farmer is a Level 2 archetype of Hardship. Luminously beautiful, her fierce independence was not understood in the Hollywood of the 40's. Convinced that her unwillingness to cooperate proved her madness, her advisors had her committed. She experienced the most brutal of psychiatric experimentation and physical mistreatment. She was finally released, but spent the rest of her life in hardship. Frances Farmer picture from Frances Farmer: 1914-1970; includes bibliography plus a Frances Farmer Photo Gallery.